from 659,00 EUR* Not ready for shipping. Reserve today and we will ship as soon as possible. from 465,00 EUR* Not ready for shipping. Reserve today and we will ship as soon as possible. from 539,00 EUR* Not ready for shipping. Reserve today and we will ship as soon as possible. from 429,00 EUR* Not ready for shipping. Reserve today and we will ship as soon as possible. 269,00 EUR* Not ready for shipping. Reserve today and we will ship as soon as possible. from 375,00 EUR* Not ready for shipping. Reserve today and we will ship as soon as possible. from 649,00 EUR* Not ready for shipping. Reserve today and we will ship as soon as possible. Filing cabinets are used for the storage of file cards and patient documents. 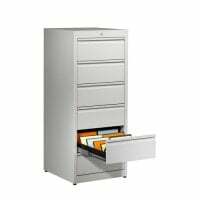 The filing cabinets, made from sturdy steel, can be hygienically cleaned and disinfected, and are very sturdy. 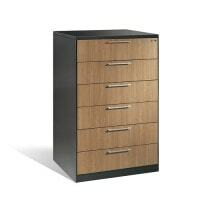 The cabinets have telescopic or ball-bearing drawers and a soundproof body. 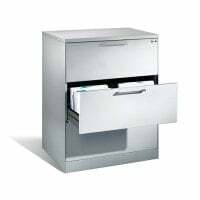 The filing cabinets are suitable for file cards and card holders in the DIN A4 format and are lockable. 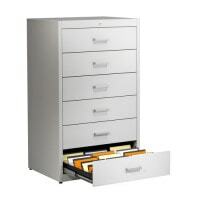 The filing cabinets from Mauser can also easily compensate for uneven floors with their set screws. 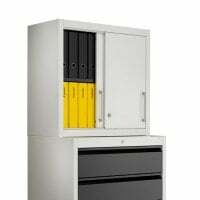 The filing cabinets are available in different versions and at affordable prices from Praxisdienst-DENTAL.